Love is in the air and whether you are a hopeless romantic or planning to spend the 14th on the couch with your dog, Zuri Bar & Dining has something for you. 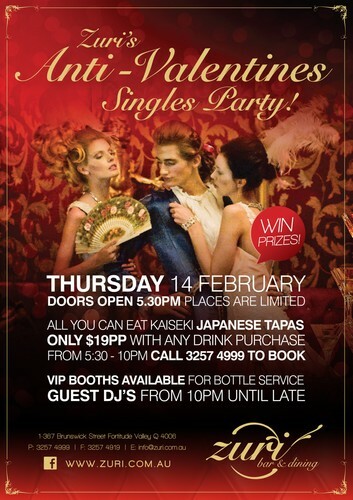 From speed dating and All You Can Eat Kaiseki (Japanese tapas) to the official Anti-Valentine's Day Singles Party and cool giveaways, Valentine's Day will be one to remember at Zuri. Start by gathering your single friends, co-workers, sisters and brothers for All You Can Eat Kaiseki Japanese tapas for only $19 per person with any drink purchase, from 5.30pm. If you are determined to meet Mr or Mrs Right then pre-book your spot in the double speed dating event hosted by Blink Dating. For only $59 per person ‘date’ a group of like-minded people while enjoying two basic beverages and canapés in Zuri’s beautiful Napoleon Lounge area. Then party into the night with awesome live DJs and the chance to win great prizes thanks to Mod Viking, Romantica Floral Designs and more, just by checking in on Facebook on 14 February. To avoid disappointment and guarantee your place as this epic Anti-Valentine’s affair, book on 07 3257 4999. Speed dating tickets can be purchased at blinkdating.com.au (then select ‘Brisbane’). Don’t spend Valentine’s Day alone; celebrate with at Zuri Bar & Dining, 1/367 Brunswick Street, Fortitude Valley.